Modern buildings are designed with a much higher level of insulation – in order to retain heat in winter and save heating costs and carbon emissions. Partly as a result of this winter efficiency there is a strong tendency for well insulated buildings to overheat in summer. The standard answer to overheating is to provide air conditioning to cool buildings in summer. However, air conditioning is very unattractive from an economic point of view (it is expensive to install and it costs a lot to run every year) and from an environmental point of view (it emits lots of carbon dioxide to the atmosphere). It also fights a fundamental principle of physics: heat naturally moves from hot places to colder places in the same way that water naturally flows down hill – if given the chance. Water can only be moved uphill with an input of energy. In the same way heat will only move to a hotter place if energy is used to force it to move in that direction. Air conditioning is used in summer when the inside of buildings become uncomfortably hot. It is likely that when cooling is required inside, the outside temperature will be even hotter. For this reason energy has to be expended to force the heat out of the building using roof-mounted chillers: air conditioning works against nature and is based on the principle of "wasting" heat. In using air conditioning you are paying good money to throw energy away into the atmosphere! Luckily there is an alternative means of providing cooling to buildings which is much more natural – less expensive because it requires less energy and free from the need to emit carbon. 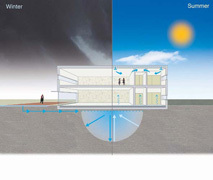 • heat is released from the building in summer down to the cold Thermalbank in the ground (in order to allow heat to escape from the building naturally). The mechanism to allow heat to escape from the Thermalbank in winter is water circulating through an array of pipes in the ground having access to an asphalt heat rejector embedded in the surface of an asphalt road: a car park can be used, or a school playground. The circulating water carries warmth from the ground out to the road surface where it is rejected to the night sky. This lowers the temperature of a large volume of ground down from its natural temperature of 10°C towards 2°C. When the building gets too hot in summer, water is circulated through underfloor piping in the building down to the cold thermalbank in the ground. This allows heat from the building to escape naturally to the ground. This type of natural cooling is also called "Free Cooling" as the only cost is the cost of a circulation pump to circulate water in a closed loop from the underfloor piping to the Thermal Bank. The asphalt heat rejector can also be used at night to reject heat to the night sky and cool the building down – this will delay the need to provide cooling the following day. If a more aggressive form of cooling is needed then a heat pump can be used in reverse to reject heat to the ground more quickly. But it will always be cheaper to reject heat to the cold ground than trying to reject heat to warm external air using chillers. The additional bonus of using this system of Natural Cooling is that the system can be reversed in winter to provide Natural Heating. All the equipment is in place to provide renewable heating – as well as renewable cooling – from one integrated system. The underfloor piping can also be used for underfloor heating, the heat pump can be used to extract heat from the ground, and the asphalt heat rejector can be used as an asphalt solar collector in summer to warm up a ThermalBank to enable more efficient heating in winter. Interseasonal Heat Transfer allows you to keep your heat from the previous summer and recycle it when needed in winter. More importantly, Interseasonal Heat Transfer allows you to keep your cool from the previous winter and recycle it when needed in summer. The ICAX approach transforms the efficiency and economics of running a ground source heat pump and becomes the clear favourite for those who plan to exceed The Merton Rule requirement of at least 10% on site renewable energy – by a large margin. For these reasons the London Borough of Merton has chosen Interseasonal Heat Transfer for its exciting new Acacia Intergenerational Centre which opened in February 2010.